C++ Builder contains a random number generator, that generates pseudo-random numbers. Random numbers are often used in games, but also can be very useful for testing purposes. 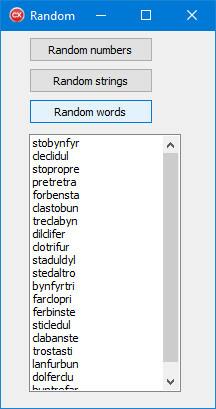 For example, you could use a generator of random words to populate a database. The function Random(Range) returns a random integer number within the range 0 <= X < Range. If Range is not specified, the result is a floatying type random number within the range 0 <= X < 1. To initialize the random number generator, add a call to Randomize() before making any calls to Random(). Start by adding 3 buttons and a listbox to your form. For our random words, we added some extra code that inserts random vowels into the random syllables. For example, "b*n" can become "ban", "ben", "bin", and so on.